Photo: nuestrociclismo.com, via Wikimedia Commons. 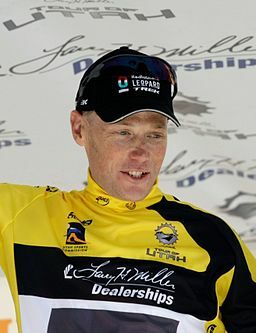 The talk of Christopher Horner’s 2013 Vuelta A Espana win unquestionably revolves around his age. At 41 years old, he is the oldest grand tour winner to date by more than a few years. His victory speaks more to hard work and belief in oneself than it does age, however. It opens some important doors too. Taking his biggest victory at age 41 is no fluke. His team’s support is key, but it’s Horners undying belief in himself that has inspired his training, diet changes, and winning aspirations. While most riders seem to retire from pro racing between the ages of 34-38, Horner had to keep racing to be able to fully display his talent. The fact that he has now done so presents an interesting opportunity for bicycle racers everywhere. It could also open the door for bicycle manufacturers, team sponsors, and race promoters looking for larger marketing opportunities. As knowledge, healthcare, and training techniques help extend the longevity of racers’ careers, the viability of middle-age racers at the highest levels of sport is increasing. Horner’s Vuelta win will undoubtedly fuel inspiration for 40-something people to train harder and smarter, slim down, and go buy that Trek, Pinarello, or Marin bike they’ve been dreaming of as just reward. When people do incredible things, it inspires others to try too, and that in turn provides opportunities for individuals and businesses alike to spawn industry and achievement. I have to wonder if Horner’s Vuelta win will inspire teams to hire more older riders looking for opportunity? They know how to train, how to take care of themselves, how to eat right, and how to be responsible. That’s valuable when considering that bicycle racers are brand ambassadors. I also wonder if companies will now more readily realize the marketing value of cycling team sponsorship? If the target market spans 20-50-year-olds, the reach is greater. And while professional racing currently grabs major news headlines, amateur racing also presents quite a value. Its visibility is high both online and at the local level, with team riders acting as billboards while training. Readership of prominent local cycling news blogs presents opportunity for companies to prop a racing platform that everyday riders can connect with. Cycling is an outstanding way for online and local retailers to set themselves apart too. If you look at the plethora of online retailers selling cycling clothing and gear now, it’s the ones who sponsor teams who gain the most credibility with bicycle enthusiasts. That’s how RealCyclist (now CompetitiveCyclist) gained credibility with racers, which increased their draw and enabled them to steal business away from local retailers. The increased business in turn enabled them to hire knowledgeable cyclists who could relate to customers and simply outperform local shops. By sponsoring teams, local shops can do the same thing, keeping visibility high and connecting with local buyers. Another great thing about sponsoring amateur cycling teams comprised of middle-aged racers is that you don’t need a huge budget. The racers appreciate being able to ride their bikes more, and that is often payment enough. Add equipment sponsors, or simply cover the cost of travel to races and entry fees, and you’ve got an affordable marketing channel with broad appeal and all-year longevity (try getting that with your latest print ad or TV spot). Sponsor local races to compliment the team, and you gain community support to boot. As Chris Horner has shown, sponsoring older riders is smart marketing because the simple truth is we’re just happy to be riding our bikes. If you watched any of the Vuelta, you could see Horner’s face lit up with a toothy grin as he climbed up mountain passes that melt the dreams of many a pro bike racer. If you contrast that brand of genuine smile against the fake ones models paint on for advertising, the value of sponsoring the middle-aged 40-something riders, teams, and the races they enter becomes inspiring in and of itself. The happiness that is evident in mature, healthy men and women racing their bikes is contagious too, upping the marketing value by increasing conversation on social media, among friends, and in news sources. Thanks to Chris Horner for putting on a great show at the Vuelta.